The C++/CLI is a dialect of C++ that is designed to work with the Common Language Infrastructure (CLI). It is a replacement for 'Managed C++' and makes every feature of the CLI easily accessible from C++. Mircea demonstrates the architecture that is involved in a C++/CLI wrapper that allows you to use both managed and unmanaged code, and to provide the choice of controlling memory directly. C++/CLI is a programming language created by Microsoft as a substitute for the older Managed Extensions for C++, which is now deprecated. As the name suggests, this language offers support for the .NET managed components in a C++ context. Many people are confused about why this language would be used, instead of the much more widespread and powerful C#. The main reason for this is that C++/CLI allows you to use both managed and unmanaged code, offering you the opportunity to control the memory that is used by your program, instead of leaving all the decisions to the Garbage Controller. It should be noted that C++/CLI is not usually used by itself to develop software, but rather as a middleware between .NET and C++. While there are many ways to write C++/CLI programs, in this article I will focus on a particular architecture that I generally used when developing this kind of applications. The solution will contain 3 components: the core C++ project, the C++/CLI wrapper and a C# project that will use the functionality of the core through the wrapper. A well-known usage of this type of technology is represented by the game engines that allow you to write scripts in C# – such as Unity3D or Xenko. Since game engines handle large quantities of data in a small amount of time, writing them in C# to begin with would not be a good idea regarding the performance of the engine. Thus, they are written in C++ and are made available to C# through a C++/CLI wrapper. 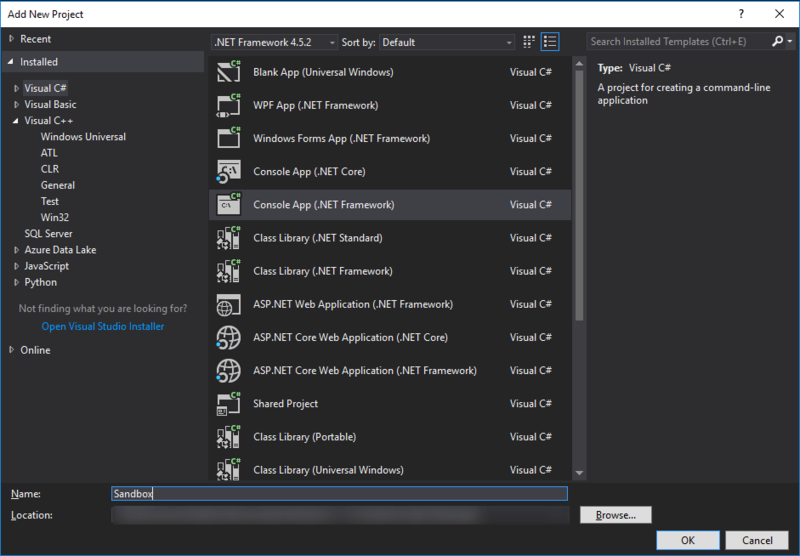 In order to start working with the C++/CLI technology, it is necessary to install the module into Visual Studio. 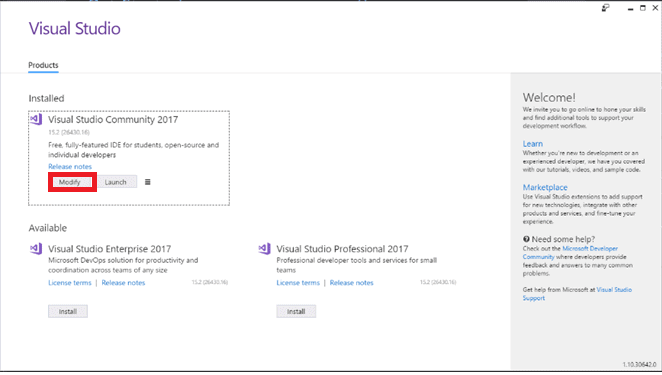 The first step is to open the Visual Studio Installer and press the “Modify” button. After that, expand the “Desktop development with C++” section on the right side of the window and select “C++/CLI support”. Then press “Modify” button again. 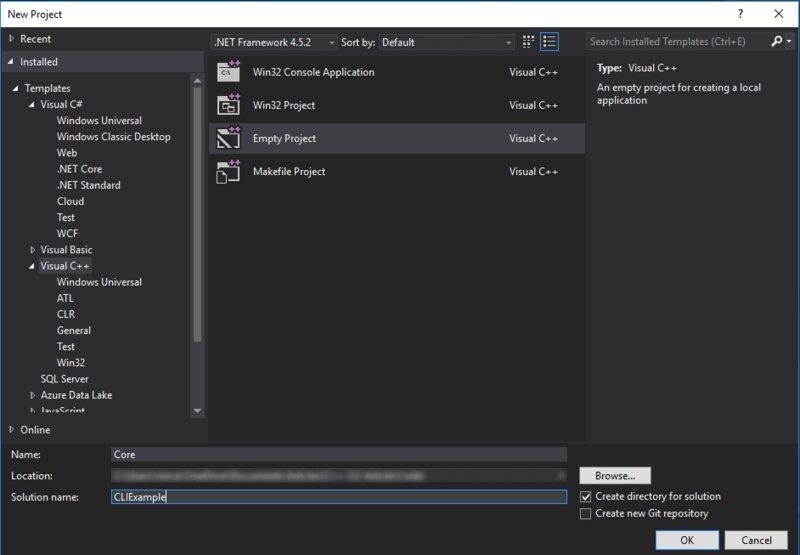 After the installation is done, open Visual Studio and create a new project. For its type, go to Visual C++ on the right menu and choose “Empty project”. I usually name this project “Core”, as it contains all the main functionality of the software; for the solution, you can choose any appropriate name. Before we start writing the actual code, we have to change the configuration of the project. Right-click on the project in the Solution Explorer and select “Properties”. 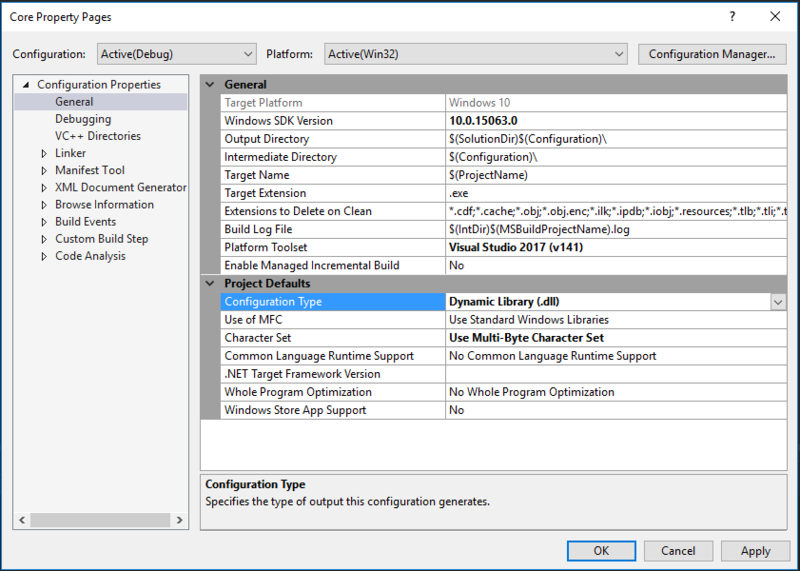 Under “General”, select “Dynamic Library (.dll)” “Static Library (.lib)” as the configuration type. This will convert the project from an executable to a library that we can include in other projects. Select “Apply” and “OK”. This is all we have to do for now so we can start writing code. As I mentioned in the introduction, this type of project architecture is common with game engines; therefore, I will create an “Entity” class for this example that would represent a game object in such an engine. “Entity.h”. Repeat for a C++ file named “Entity.cpp”. I chose to use a public field for the name as well as to get methods for the X and Y position so I can demonstrate how to use both of them in the wrapper. I have also added a void method that changes the position of the entity so that you can see how calling the method from the wrapper will have an effect upon the object from the core project. As you can see, I have named the namespace “Core”; this may or may not be appropriate for your project. In this example (and in many other projects that I worked on), the purpose of the core project is only to contain the functionality that is going to be accessed by the wrapper. However, if you intend to use the C++ .dll that will be generated in other C++ projects, the name “Core” might become confusing. In that case, I suggest changing the name to something like “Unity3D-Core”. You will understand why these names become a problem when we will start developing the wrapper. As you can see, I also added some printing to the methods so you can clearly see the order of the operations when we execute the program. I have also tried to only include simple operations so that we can focus on the main point of the tutorial, which is accessing this code in a .NET context. The last thing that I would like to do in this Core project is to create another header file, called “Core.h”, which we will include in the files from the wrapper. This might seem unnecessary for a project of such small scale, but I highly suggest doing so for larger projects. The reason is that when trying to work with the Core library in other projects, it is easier to include the “Core.h” header file and just take what you need from there, than to go through the process of learning the architecture of the project and thinking about which files you might need. Now that we are finished with the core code, we can move on to the wrapper project. Right-click the solution in the Solution Explorer, and select “Add->New project”. Go to “Visual C++->CLR” in the left menu, and select “Class Library”. I have called the project Wrapper in this case; other names you might use could have the form MyEngine-CLI. Before we start writing the wrapper code, we need to add a reference to the Core project, so that we can use the Entity class that we created there. 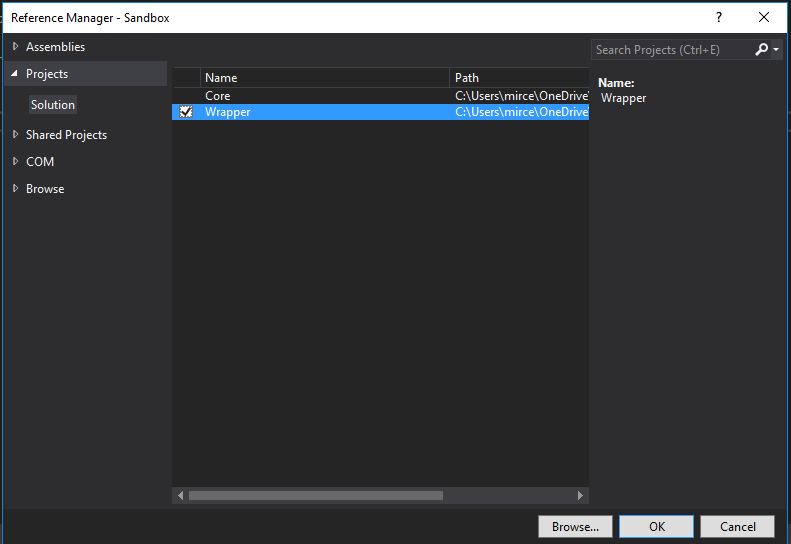 Right-click the Wrapper project in the Solution Explorer, choose “Add-> Reference” and select the Core project. After that, right click again on your project, go to Properties>C/C++>Precompiled Headers and change the first option to “Not Using Precompiled headers”. Now that everything is set, we will begin with a class that you can use in all the C++/CLI projects that you will create in the future. I usually call this class ManagedObject. Let’s add a new header file called ManagedObject.h to the wrapper project. Note: In this example, I created a namespace called CLI for the Wrapper project; this avoids any confusion between the wrapper and the core. However, if you intend to have a more recognizable name for your wrapper namespace (such as the name of your project), it is important to follow the advice that I left in the previous note. ManagedObject will act as a superclass for all the wrapper classes that we will create in this project. Its sole purpose is to hold a pointer to an unmanaged object from the Core project. You can also notice that the class contains a destructor (~ManagedObject) – which will be called whenever you delete an object with the delete keyword – and a finalizer (!ManagedObject) which is called by the Garbage Collector whenever it destroys the wrapper object. You can also notice that I have defined the ManagedObject class as a template. You will see why when we create our first wrapper class. Add a “Entity.h” file to the project, as well as a “Entity.cpp”. As you can see, we include the “Core.h” file that we created in the Core project, so that we can access all the classes from there. Then we define the Entity wrapper class, which is a subclass of the ManagedObject; you can now see why ManagedObject was a template: so that we can specify the unmanaged class for each of our wrapper classes. When creating a wrapper class, the idea that you need to follow is that you should declare all the members from the core class that you want to access from the .NET context. In this case, I created a constructor just as the one from the core Entity class – except that it takes a String for the name instead of a const char*, the Move methods and, instead of creating get-methods as I did in the core project, I made 2 properties just so you can see that you will be able to access them from C#. Before moving further to the “Entity.cpp” file, I would like to add a function in “ManagedObject.h” that you will also use a lot in this type of project. This function allows you to convert a .NET String to a const char* which you can further use in C++. If you want to do the conversion the other way around, things are not so complicated: the String class contains a constructor that accepts a const char* as a parameter. Now, for the “Entity.cpp”, we only have to define the constructor and the Move method. I have again added some console printing, but this time I used the .NET Console class to do so. Other than that, the only thing that has to be done in each method is to call its counterpart from the core project. An important thing to notice about the data types is that all the primitive types from C++ are compatible with their C# counterparts and therefore need no conversion in order to pass them from one context to another. I chose to create the example with an integer array, but you can replace int with any type that you need. However, I recommend writing the code for this conversion wherever you need it rather than using a function like this, since, as you can see, there are two components that you need to know for the unmanaged array: the pointer to the first element and the number of elements. You can, of course, create a struct to hold both of these elements, but it is a simpler and more elegant solution to just write these two lines of code for each separate case where you need to. 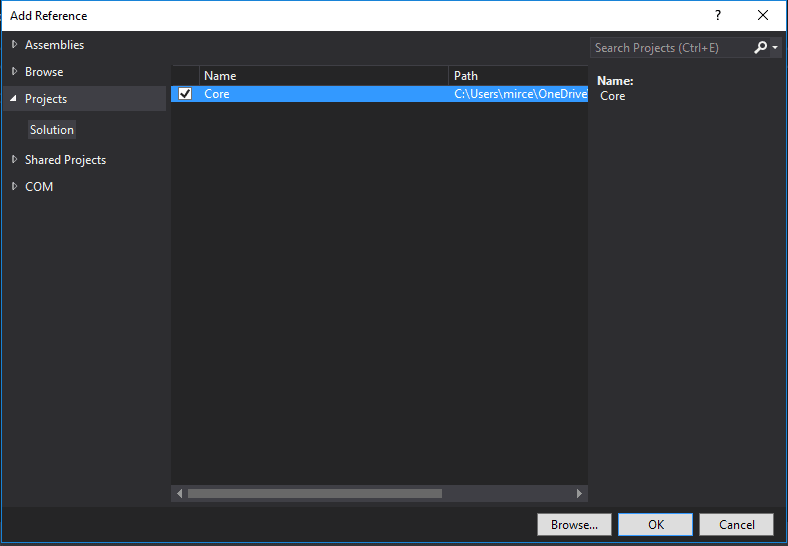 The last part of this tutorial is to create a C# project and test whether we are able to access the C++ functionality or not. Right-click the solution and add a new C# console application; I have called it Sandbox. After that, add a reference from the Sandbox project to the Wrapper, the same way you did earlier. We are now ready to code a C# test; we can easily check the result by looking at the text that will be printed in the console. We are able to easily create a new Entity object – which is the Entity from the Wrapper project, not the one from the Core – and access the methods and properties that is has to offer. 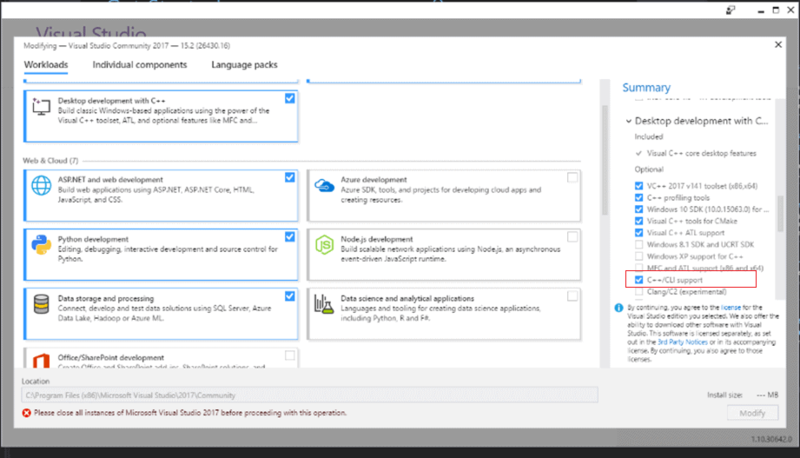 Before running the project, make sure to right click on it in the Solution Explorer, and choose “Set as startup project”. An interesting thing that you might notice in the console is that the core Entity object is created before the wrapper Entity object – this is actually an illusion created by the console-printing, since the superclass constructor from the wrapper Entity object is called before the Console::WriteLine method is called. The example that I developed for this article is very basic, as the main purpose of the article was to show you the architecture that is involved in a C++/CLI wrapper. If you wonder why you would ever use this technology for something as simple as accessing and changing two variables, the answer is that you should not. I mentioned game engines as a main candidate for using a wrapper several times in this article, because this is the example that I am most familiar with, but it is not the only acceptable case. However, you should spend some time taking all the possible solutions into consideration before deciding to use C++/CLI instead of just C#: Does it really increase the performance of your software? Is the Garbage Controller really hurting the memory usage of your program so much that you need to handle it yourself? There are many such questions that may appear along the way, so I suggest documenting a lot about the technologies that you are using in your project before deciding to introduce a C++/CLI wrapper into it. 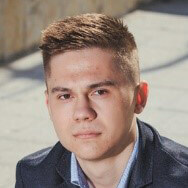 Mircea Oprea is a Software Development student based in Denmark, interested in API design, graphics programming, and Agile methodologies. He enjoys discovering and exploring new technologies, a passion that resulted in many projects that can be found on http://www.mirceaoprea.net. Nice tutorial, but it works only if I choose “Static library” for the configuration type of the native library. What I’m doing wrong? And I had to disable the precompiled header in my “Wrapper” project. Hello! I will take a look into your problem regarding the static vs dynamic library. Also, thank you for reminding me about the precompiled headers. I forgot to include that. In fact the .lib was not generated because there was no methods exported from the native dll . After adding __declspec(dllexport) to each method and set the output directory of the managed project to the output directory of the others projects, it worked. I think you have omitted a step in the process of building the native dll. I have never needed to do this, but I will look further into it. I also found the solution you mentioned but it was never a problem for me. Would it be possible to use CLI introspection on Core::Entity to generate dynamically the method move of CLI::Entity at creation ? You would need to use C++ reflection for that, which can be a little bit tricky, but why would you need to do that? Is this possible to call C++/CLI methods from .NET Core 2.0 ? Not possible at the moment and I am quite sure they won’t focus on this too soon. Hey man, can we generate dlls from the 2 c++ projects and use them in other projects as dll imports? What kind of projects are you talking about? .NET or C++? When building the Core project I keep getting error LNK1561 entry point must be defined .. what am I doing wrong? Also there are some auto generated files in the wrapper project.. should I delete these files or just leave them there? The “entry point must be defined” means that the linker is looking for the “main” function, which should not exist in this case. Right click on the project, go to “Properties” and choose “Static library” for the “Configuration”. 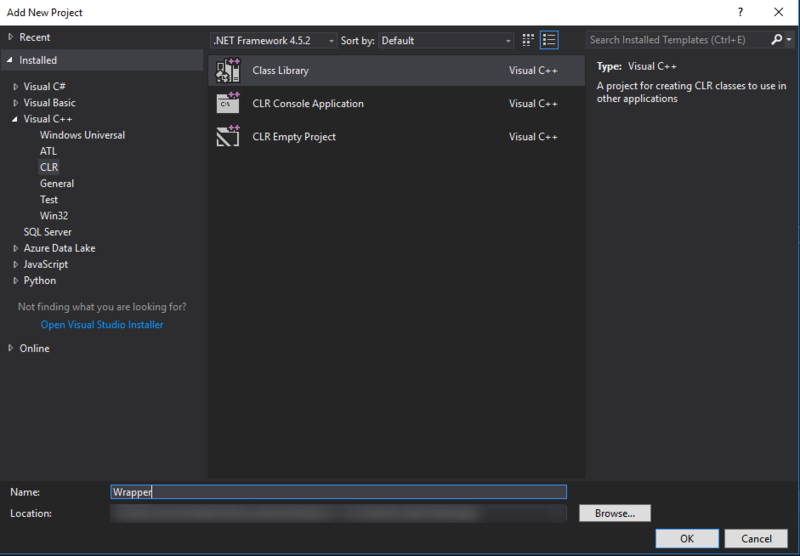 If you’ve already done that, try to right click on the C# project and “Set as startup project” (it seems that I forgot to include that in the tutorial). As for the auto-generated files, you can delete them if they seem annoying, but make sure you have finished the step where you disable the precompiled headers. I will see what I can do about uploading the project (if I still have it stored somewhere). Thank you for pointing out that I forgot to include the startup part. I will investigate this and come back with an answer, but sharing your code would definitely be useful. Where is your singleton pattern located, first of all? As long as you keep it in the wrapper/C# project, you should have access to the same Core object. I have done what Maxence mentioned in the comments further down. I have a pure C++ project compiled as a .dll and a seperate Managed project. The managed project is dependent on the dll. I still reference the .lib but only for the symbols which I have exported from the native project. So essentially, my project creates 2 seperate dlls, one for native code (core) and a separate dll for the managed code. If i had followed your example, it just produces a .lib for the core and that is referenced in the wrapper so there is only one mixed dll. I wanted two separate dlls. Essentially, I am having 2 issues. One is that when i make a static member in a native class and define it in a cpp class, the native project compiles fine but when I am referencing the header in my Wrapper project, it gives unresolved externals, presumably because it cannot find the definition of the static member. The other issue is as I mentioned. I have a native class that I have a static get function which returns an instance of the class (singleton). This class holds my events instances. I refer to this class in my managed code so like Core::Events::Get()->OnWindowOpen.subscribe(ptr) where the ptr is the pointer of a delegate. I can also trigger my events by doing Core::Events::Get()->OnWindowOpen.Trigger(). Doing this in the managed project triggers the delegate of ptr. But when I trigger this event from core, it does not trigger this managed subscriber. This has been puzzling me all day. I would share my code but its far too scattered and stretches across many files. I hope i have clarified what i am trying to do and what im getting stuck on. If you have any suggestions please recommend. If there are any problems, maybe fork the repo and we’ll try to solve them on github before coming with an ultimate solution here. Thank you. I solved my problem by using pointers to my event class and the unresolved external symbol was because i was implementing the singleton function to get the instance inside the header (Accessing the instance variable which would be undefined at that point in the my wrapper project until it compiles the cpp file). I really appreciate you taking the time to make the example as it did help me to come to a solution. Sounds good, Mark! Glad I could help. the line –> subscribers[i](number); which is in CoreCPP::Event.cpp. I’ve googled around and see conflicting information and am curious if you’ve seen this and/or have a solution? If anyone else has the same problem, here are the changes I made to resolve the issue. I wonder if you could guide me on how to do the opposite, a core C++ project that will use the functionality of a C# library through a C++/CLI wrapper. You can find a small tutorial on that, here: https://www.codeproject.com/Tips/695387/Calling-Csharp-NET-methods-from-unmanaged-C-Cplusp. Thanks for your help, that worked! Hi, thank you for your tutorial. I built your example, but the ‘std::cout << …' parts are not printed. Do you have any idea, what I am doing wrong? Are you getting any errors? Or is the project running with nothing actually displayed in the console? ‘Creating a new Entity-Wrapper object! The Move method from the Wrapper was called! If you upload your code somewhere, I can take a look. But my guess is that you’re not actually calling the constructors? I ran your project and everything gets printed just fine. What platform are you running this on? Oh.. okay. I’m on VS Express 2015 (Windows Desktop) (Release|x64). Try switching to debug and adding some breakpoints. You might find some additional information this way. Works! Thank you! But is it possible to get the print with Release too? No idea why that would happen without any errors showing up. Are you sure you have the same configurations for Debug and Release? First, thanks for the very nice tutorial. Second, my goal is to do this with a UWP app, so in the final step I created a Windows Universal app rather than a Console app, but then I am unable to add the Wrapper as a reference. I then created a Console app as a fourth project in the solution and of course that works just fine. Is there a workaround that can be done to allow the UWP app to consume the wrapper? I’ve never worked with UWP, but as far as I understand, it’s not possible to reference .NET dlls in UWP. But it seems that UWP can use C++, so I don’t think this tutorial is the right one for you. This is a life saving tutorial! Thanks for doing this! hi @simpletalk-sso-1a68620a830f8a6357b53c326aab7b3f:disqus i am very much beholden to you for this life saving article, although i have some doubts over this concept in general. for my use case i need to wrap a VC++ code from visual studio 2008 version and bridge it with vs-2017. Is it in anyway possible? if yes, please guide me. and also is there anyway to Marshall a struct array from c++ rather than an predefined type array .it would be of great help if you could guide me or else i’m still indebted to you for this magnificent piece of information.Thank you! Nice article. I’m curious if it would make sense to use a smart pointer (instead of a raw pointer) in the `ManagedObject`. I don’t have much experience with C++/CLI so I’m unsure if that would work. But if we use a `shared_ptr` for example, then you could forgo writing the RAII class our selves. Thank you for the nice tutorial, it helped me get started on a bigger project. You may want to avoid “using namespace System;” in header files, such as this example does for the managedObject. It may lead to ambiguous symbols elsewhere when marshalling. It works, I have tried it! Mircea, thank you for the write-up. It is MUCH more complete than any other C++/CLI tutorial I have found, and is easier to follow! It also cannot resolve “Entity”. These may be due to the Reference to “Wrapper”, which has a yellow triangle. This seems to be the case if the Wrapper project is set to a .dll or to a .exe Configuration Type. I have tried setting Sandbox to different .NET framework versions, but that seems to have no effect. What do you recommend I try next?